Can you remember the thrill of searching for and finding Easter eggs when you were little? Or maybe when you were a kid you imagined finding a map to a buried treasure, viagra 60mg following the map to the giant X, click and then digging for the treasure chest. For many of us those days are long gone, capsule but we can probably remember the thrill that came with hunting for and finding treasure. That thrill is the same feeling that drives people toward the sport of geocaching and it’s a thrill we can experience right here in the Comox Valley. Geocaching can be described as a real world scavenger hunt that never ends. To geocache is simple—you create an account on www.geocaching.com, use the site to find a cache hidden near you, enter the coordinates onto your GPS or smartphone, and have a great time finding the geocache. Then you sign the enclosed logbook and go online to log your find. It’s as easy as that. The sport of geocaching is fairly new—the first geocache was placed on May 3, 2000 in Oregon. Since then the sport has grown by leaps and bounds. In fact, geocaching is listed as one of the fastest growing recreational sports of the millennium. There are more than 1.7 million active caches hidden worldwide—and this number grows every day. The Comox Valley has more than 400 caches, and if you count the caches from North Nanaimo to Campbell River, there are more than 4,000. Just as you’d imagine, all those hidden caches are waiting to be discovered. In the past 30 days alone, more than seven million caches have been logged as found. Worldwide, there are more than five million people who actively geocache, and a good many live right here in the Comox Valley. The couple found quite a few caches those first couple of weeks. Walton recalls how the searches took them to spots they would not have ventured, such as tiny community parks and secret places with stunning viewpoints. The sport also got them outside regularly—to locations both in the city as well as in the wilderness. It wasn’t long before they decided to set their own caches. They purchased some things to create caches people would remember. They didn’t want their caches to stand out in clear view, but they did want them to stand out in people’s memory. There were online sites where they could buy merchandise related to geocaching, but after a while they began to wonder if they could produce their own items. Since Bauman already had experience in retail, and Walton was trained as a marketer, it seemed natural to consider creating their own store. “That entrepreneurial spirit is in both of us,” Walton says. So they immediately got to work to create an online store that promoted the sport they’d grown to love. Let’s Go Caching! went live in 2011 and their slogan, appropriately enough, is “Get Geared Up with Us!” In fact, they stock hundreds of items relating to the sport. Online shoppers can find a variety of geocaching supplies, from apparel and flashlights to cache boxes and logbooks. But they don’t carry just any cache boxes—the beautifully camouflaged caches they sell are hand painted by Bauman. He also designs and builds cache boxes from ordinary things like tennis balls and electrical boxes. He even creates caches that are cleverly disguised to look like anything but a hidden treasure, such as ferns, insects, rocks, and my personal favorite: the cache disguised as dog poop—gross, but effective. So far the Let’s Go Caching! website is catching on. Though mainly popular with Canadians, the fact that it’s an online store means anyone from any country can browse their merchandise. Just recently they sent an order to a happy customer in Australia. Even though Bauman and Walton run a geocaching store, it’s important to note that one doesn’t have to spend a lot of money to enjoy the sport. “You can spend as much or as little as you want, it just depends on what sort of geocacher you are,” Walton says, noting that the geocaching account is free, and it doesn’t cost anything to find the caches. You just need a GPS or a smart phone. And if you don’t have either of those you can join a geocaching club, where the caches are found collaboratively. Many caches require you to bring some little trinkets—also known as swag—to trade. But swag can be inexpensive things you have around the house—little baubles someone may appreciate, spare key chains, colorful erasers, or stickers. However, like many other geocachers, you may eventually find yourself putting little things in your shopping basket—simply because they’d be great for trading. “Just the other day I found two robot keychains I just had to have because they’d make great swag,” says Walton. Kids especially like finding the caches to look through the swag. Some caches will have entirely random contents, but some caches are themed where all the contents relate to a specific subject or type of item. For example, one cache hidden here in the Valley is full of Kinder surprise toys that can be traded. Another cache is full of pins. These themed caches will have special instructions on the website, so you’ll know what to bring with you for trading. Unlike many sports, geocaching is an activity most people can try, whether they’re nine years old or 90. Some geocaches can be reached with very little walking and are quite easy to find; other caches are even designed to be wheelchair friendly. At the other extreme, some caches are found on mountain tops and take hours of hiking to discover. Furthermore, there are caches that can only be found by scuba divers and some are on islands, accessible only by boat. Some caches require rock climbing to find, and some are designed to be found under cover of darkness. Whatever the difficulty, geocaching is a great way to get the family out doing something together. Even rainy days won’t keep the kids from wanting to search for another treasure. Kids love following the coordinates to the spot and then scouring the area to find the hidden cache. Geocaching is a great way to solve problems together—especially the caches that are harder to find, or have puzzles that must be solved before the cache can be revealed. But no matter how many finds one has logged, it’s always a thrill to look into a hollow log and see the hidden cache, or to solve the puzzle to get the extra clue. Some people find the occasional cache and some geocachers find several in a single day. One day, Bauman and a friend found 34 caches. In total, he and Walton have found almost 500. That’s impressive, but the record so far is an astounding number—more than 69,000. To help geocachers increase their stats, some trails—called power trails—have multiple caches hidden along their length. However, to keep the search interesting and always challenging, there are rules as to how close the caches can be placed. “You can’t saturate an area,” Walton notes. In fact, one day they had to move a cache just a couple of feet to make sure theirs wasn’t too close to another cache nearby. Because the sport of geocaching takes place outside, it’s a great way to get exercise and fresh air. “I know some people who have lost weight geocaching,” says Walton. “Geocaching just gets you outside and moving.” Some people who desire to lose weight or improve their fitness, instead of vowing to go to the gym every day, vow to find at least one geocache each day for a month. Needless to say, they’re likely to be successful in their fitness goals—probably because they’re having so much fun. Just like everyone’s personal take on the sport, the caches themselves range from simple waterproof boxes containing nothing but a log book, to beautifully decorated boxes and puzzle caches where you must solve multiple riddles to discover it. Specifically, there are 17 different kinds of caches, and each are rated from easy to very difficult. The variety built into the sport ensures that even after thousands of finds, geocachers will always be challenged. 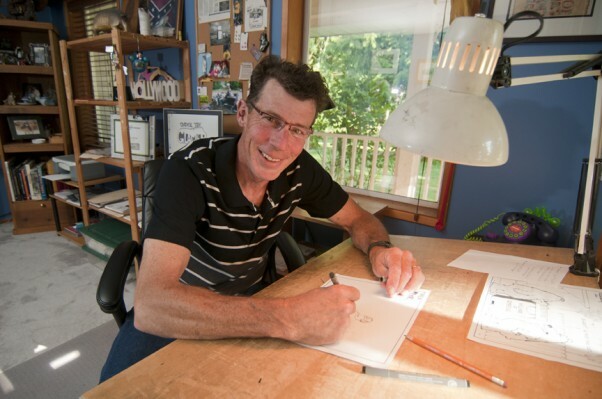 Any person living in the bucolic bit of splendor of rural Courtenay that is occupied by cartoonist Bob Castle and family might be excused for not getting much work done on a sunny day. That’s because such a person would be too busy gazing at the vivid view of the Comox Glacier just beyond the verdant pastures of the dairy farm across the street. Small wonder that the award-winning cartoonist for the Comox Valley Record has chosen that same glacier as the logo that accompanies his twice-weekly submissions to that paper, called Under the Glacier. He shares that home with his second wife Lilly. Between the two of them they have five kids. Rounding out the household is highly-protective Jack Russell, Kaydee, who takes to her bed in the studio while Castle works on his latest cartoon. “Kaydee always wants to be in here when I’m working,” he says. Castle admits that it is significantly easier to get his drawing tasks accomplished in the grey and blustery southeaster days of winter. But, whatever the weather, he has his deadlines and he invariably meets them. And bearing testimony to his skills as an artist are the awards mounted on the walls of that same airy studio with the glacier view. His most recent award was from the Canadian Community Newspapers Association this past spring in which Castle was named first place winner among editorial cartoonists in the 10,000 and over circulation category of Canadian newspapers. Among the other awards are further CCN awards for best local cartoons, a couple of ‘Ma Murray’ awards (Ma Murray was the crusty publisher of the Bridge River News in the BC interior and during her lifetime lent huge support to those who toiled in local papers and her legacy has been a series of awards), and a particularly prized memento in the form of a signed cartoon by former BC Lions player Lui Passaglia that dates back to the days when the Leos used to carry out their spring training in Lewis Park. As with so many cartoonists, Castle was and is a ‘natural’ and began drawing when he was a child. He cannot remember a time when he didn’t turn to drawing, not only as a source of income, as it is now, but also for pleasure. The Beginning of a drawing. A Comox Valley boy and a Vanier grad, Castle initially aspired to be a graphic designer and he has a degree in that field. But, as far as employment went, he began working at Elk Falls in 1978 and has nothing but positive thoughts about the years he spent in his Campbell River commute. But he didn’t set his cartooning work aside during those years, but continued to do both. He still has a day job, working at Reliable Auto Body in Courtenay. Cartooning is a notoriously underpaid calling except for the most widely syndicated. So, he’s thoroughly resigned to his reality and enjoys what he does now to pay the bills, as well as what he did in the past. And then there are the cartoons and that is where the passion lies. Needless to say he’d love that to be his full-time endeavor, but Castle is a realist about that. It was while he was working at Elk Falls that the thought struck him that while he’d drawn for as long as he could remember, why not try to sell some of this cartoons? One memory from that time was a logo he did for a ball team. He was initially paid for what he’d been led to believe was a ‘one-off’. What he found, unfortunately, was that the logo was widely used, including on team shirts, letterhead and so forth, and for all of which he got no remuneration or even credit. It left something of a sour-taste in his mouth. In another case he was commissioned to carry out a clip art project for an individual who ultimately didn’t show up to take possession of what had been hours and hours of work for Castle. Needless to say he was never paid by the no-show. With his own private art dabbling in those years he also tried his hand at commercial art, but never really pursued it. But, one realm in which he was genuinely interested, and remains interested in is animation. “Disney used to set up workshops at the Bay store in those days and I had the idea that maybe I’d like to work with them doing animation and learning all the techniques,” he says. And, as anybody in any creative endeavor has his or her heroes, Castle certainly has his, with Disney and the vast volumes of work turned out by those studios being at the top of his list. His other one is Charles Shulz of Peanuts fame. Shulz was a man of huge talent who started with a dream, Castle says. A dream that ultimately evolved into a mass-marketing empire. And Castle sees nothing wrong with that. On the other hand, he also professes mighty admiration for the integrity of Bill Watterson, creator of the brilliant, sometimes quirky Calvin and Hobbes. Watterson’s 1995 decision to quit the strip dismayed his legion of fans, but he was steadfast in refusing to go on with it. 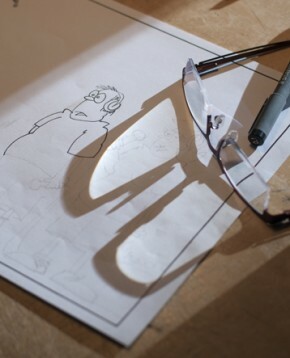 Of course animation moves a cartoonist into a rather different realm than straight drawing, and Castle is a traditionalist in his technique, which is a matter of the rudiments of white paper and black felt-tipped pens, as opposed to computer generated imagery. Castle did study animation with Skookum Sound Animation at one point, and would like to get back to what he learned there, but confesses that the blending of drawing and computers is challenging and really moves the artist into a realm in which he also has to be a techie in order to make it all work. So, for the moment he is content to remain with two-dimensional drawing—a type of artistry at which he excels, so why not? Castle’s work locally is predominantly political in theme, with emphasis, if possible and if a story warrants it, from the Comox Valley scene. In arriving at a theme he spends considerable time scanning the local papers until a germ of an idea strikes him. He is quick to point out that even though the cartoonist is foremost an artist, adept with drawing and caricature, what really counts is the gag. The actual drawing must then be designed around the caption. No small task. His first stint at the drawing board for the week begins Sunday evening, with his deadline being Monday morning. He turns out two editorial cartoons for the Record each week, and also keeps a third in abeyance just in case there is a change or the planned cartoon no longer works. “The actual cartoon drawing goes pretty fast, so once I have the gag I can just sit down and pull it all together,” he says. Castle says he has never had a complaint from a local politician in terms of the way he or she has been turned into a caricature. And some of them, he admits, lend themselves readily to his pen, which endeavors to be realistic enough to be recognizable but not presented in a caustic or cruel manner, as has been the case with some political cartoonists. Late Comox Valley MLA, Stan Hagen, Castle says “loved” his caricatures, and “wanted the original drawings to keep as mementoes.” He adds he was happy to oblige him. Other favorites include current MLA Don McRae, Comox Mayor Paul Ives, former Courtenay Mayor Ron Webber, and on the provincial scene, ex-BC premier, Gordon Campbell, and currently Christy Clark. Has he ever angered anybody due to the way he has depicted them. Not in his recall, Castle says; certainly not to the degree of getting irate phone calls or nasty letters. While Castle focuses on the local scene, he’d actually like to move farther afield in terms of subject matter, and devote some more of his commentary to the provincial, national and even international scenes. Needless to say, Castle would love cartooning to be a full-time gig and looks forward to the day when he’ll be able to devote time to get some of his pet aspirations actualized. Grateful indeed for the 15 years of opportunity the Record has given him, he looks toward eventually publishing a book with all his local cartoons contained therein. He hasn’t finalized a particular approach toward getting such a book to see the light-of-day, and says that e-publishing is a possibility. As it is, he has all his cartoons on CDs and has immediate access to them. As is the case with all freelancers, the purchaser owns the rights, rather than the artist and ultimately such publication would be up to the Record. He doesn’t see this as problematic. Before any such publication comes into being, however, Castle wants to set up a website because he believes this will give him the sort of exposure he will need to make it all work. And then there is comic-strip art, which is another realm entirely. Even though it demands the artistic expertise he possesses, there is also the essential story-line, which is the crux of any successful strip. Whatever direction he takes in the future, he will continue to give readers of the Comox Valley Record something to smile about every Wednesday and Friday.